Het jongste nummer van Spiegel der Letteren (2018, 3-4) bevat een bijdrage van mijn hand over de ontstaansgeschiedenis van het monument voor Lucretia Wilhelmina van Merken in de Oude Kerk te Amsterdam: ‘Vrij van faamziekte. Over de oprichting van het gedenkteken voor Lucretia Wilhelmina van Merken (1721-1789) in de Oude Kerk te Amsterdam in 1828’. The literary fame of Lucretia Wilhelmina van Merken (1721-1789) has been described in terms of rise and fall. 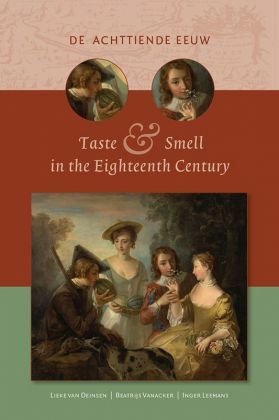 In the decades following her death, her reputation rapidly changed from being one of the most popular and well-respected Dutch authors to a somewhat boring representative of the old-fashioned eighteenth-century literature. In 1828, over thirty years later, the Amsterdam Genootschap voor Uiterlijke Welsprekendheid managed, nevertheless, to erect a monument in honour of Van Merken and her husband, Nicolaas van Winter (1718-1795), in the Oude Kerk in Amsterdam. But why? A hitherto unknown manuscript in the collection of the Koninklijk Oudheidkundig Genootschap in the Rijksmuseum sheds new light on the realisation of this project and allows us to place the initiative in the context of the growing desire for public memorials in the early nineteenth century and the still complicated relation between female authorship and celebrity culture. Zie mijn Academia voor een PDF van de publicatie. On March 21 & 22 the annual conference of the Dutch-Belgian Society for Eighteenth-Century Studies takes place at the KU Leuven. This year the conference addresses the visual and textual representations of female authority in early modern Europe. How did female intellectuals and professionals construct their public profile in a period when femininity was primarily associated with the private sphere? Which function did portraits and publications had in this process and how was the dynamics between locale and international fame? Papers will be given in English and French. Keynote speakers include Cordula von Wyhe (York University), Biancamaria Fontana (Université de Lausanne) and Catriona Seth (Oxford University). You can find the full programme and the abstracts on our conference website. The recently published issue of The Rijksmuseum Bulletin includes my article on the discovery of the long-lost portrait of Christina Leonora de Neufville entitled ‘The Face of the Female Voltaire: Nicolaas Verkolje’s Portrait of Christina Leonora de Neufville (1713-1781).